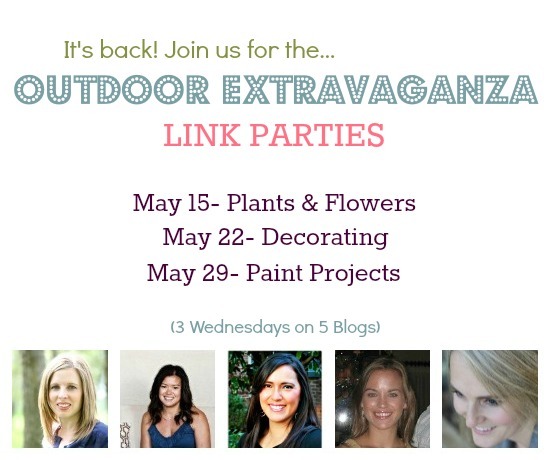 Last year I introduced you to the Outdoor Extravaganza link parties, and I’m so excited to tell you this fun series is back! This time, I’m joining Tiffany, Carmel, Dawn, and Barbara to share some of the outdoor projects we’ve been working on, and to invite you to join in the fun. Be sure to mark your calendars- dates and themes are above. Remember it’s outdoor projects, so start working on them now. We’re talking window boxes, outdoor lounge areas, benches, tablescapes, lanterns, and more. Procrastinating? Need a little motivation to get going on some projects? This is it! Not only will your project be seen on all 5 blogs, but we’re also looking for fantastic ideas to pin, share, and feature. I have a few fun gardening and outdoor decorating ideas up my sleeve, and I can’t wait to show them to you. See you there! Oh, and we’d love it if you could spread the word (share buttons are below). Thanks! Yay!!! I’ve shared your linky party announcement and looking forward to participating! Time to get busy outside and enjoy some DIY Springtime style!! Thanks Heather! So looking forward to seeing your projects! Only one month away, so I’m definitely hoping the snow is definitely gone. The sun is shining in Calgary today, and that’s always a good thing. See you in May! Thanks for hosting Shauna – this is making me feel like spring is finally here! We can only hope. Perhaps we’ll go straight into summer! This is fantastic motivation Shauna! Can’t wait to see all the amazing ideas and link up too! Definitely getting in on this!! Can’t wait for May! I’m inspired! Now let’s see if I can get the lead out!!! Thanks for the reminder of this fun party! I marked it on my calendar! Can’t wait to see your ideas!